Immediate reports indicate that six people were killed and 45 others injured when passenger and freight trains collided in the Narofominsk district west of Moscow. Investigators focus on three working theories. Six people were killed and 45 others injured when a passenger train and a freight train collided in the Narofominsk district, west of Moscow. Five of the six people are Moldovan citizens, Moscow Region's Health Minister Nina Suslonova said. "The freight train that collided with a passenger train on Tuesday carried cargo for the concern Renault from Romania, a source with knowledge of the situation told Interfax. "A total of 50 people were injured, of which five died in the crash. Fifteen of them are in a serious condition," the Emergency Situations Ministry said. The Moscow-Chisinau passenger train clashed with a freight train 80 kilometers from Moscow at 1:00pm, Moscow time, on Tuesday. "The freight train's 16 cars transporting containers derailed. Two of the Moscow-Chisinau passenger train’s carriages were damaged as a result of the collision," a Russian Railways source said early on Tuesday. The authorities later confirmed that the death toll from the train crash had risen to five. Eighteen emergency services brigades and one aeromedical brigade are working on the site. According to a source in the law enforcement agencies, 25 people were rushed to hospitals outside Moscow after the crash. 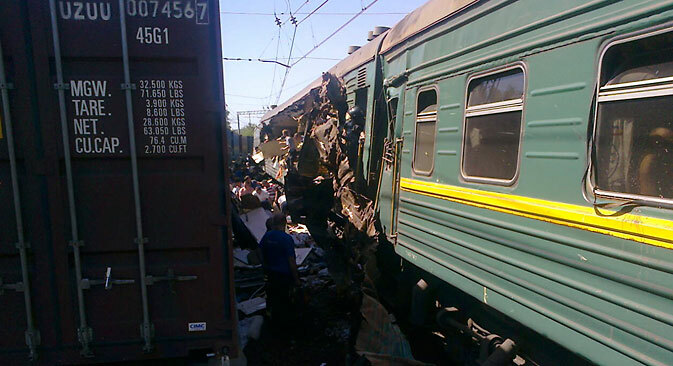 "Twenty-five victims were taken to hospitals from the scene as of 2 p.m. [Moscow time]," the source told Interfax. The Investigative Committee has already opened a criminal case. Investigators probing the train collision near Naro-Fominsk are pursuing three lines of inquiry, including faulty tracks, Russian Investigative Committee (RIC) spokesman Vladimir Markin said. "Currently the inquiry focuses on three theories: improper condition of the freight train, improper condition of the railway tracks, and failings by members of the freight train's locomotive brigade," Markin told Interfax on Tuesday.